I dreamed that Bob Dylan was having dinner with my friend Michael and he invited me to tag along. They talked seriously about music trivia for hours in the old wood-paneled café. I was surprised at how much better Dylan looked in person. I was going to tell him but decided it sounded too dumb. So I just sat there silently, trying to inconspicuously flirt with him. Then my calico cat Fiona woke me up, making those telltale, pre-puking sounds cats make. I pushed her off the bed and tried to go back to sleep since it was still dark. Just as I’d finally fallen back asleep she started licking my eyebrow. I gave up trying to sleep and spent the day feeling dopey and too tired to do the oil painting I had planned. Instead it seemed like a really good idea to wash off the entire background of the Big Tulip painting I thought I’d “finished.” More about that later…now off to get some sleep! Great job! You captured him. If you’re a BD fan, you might want to check out the current semi-finalists on America’s Got Talent. There’s a young fellow from down South (forget his name) that sings and plays guitar, and sounds hauntingly like Dylan. Even wore a porkpie hat the first few times on the show, but ditched it last week. You really captured his eyes, nose and expression. Very nice! Love this post! You crack me up! Fantastic! As a BD fan, I am delighted with this. And too bad the cat woke you. The dream was good!!! What a grand story and wonderful painting! Glad someone else has odd dreams too:)! This definitely made me smile. I have the oddest dreams and I’m always telling my friends about them. Most of them look at me like I’m crazy because they either don’t remember theirs, or theirs are very ordinary! Nice portrait of Dylan! Great source from which to create art! Your dream! Enchanting! 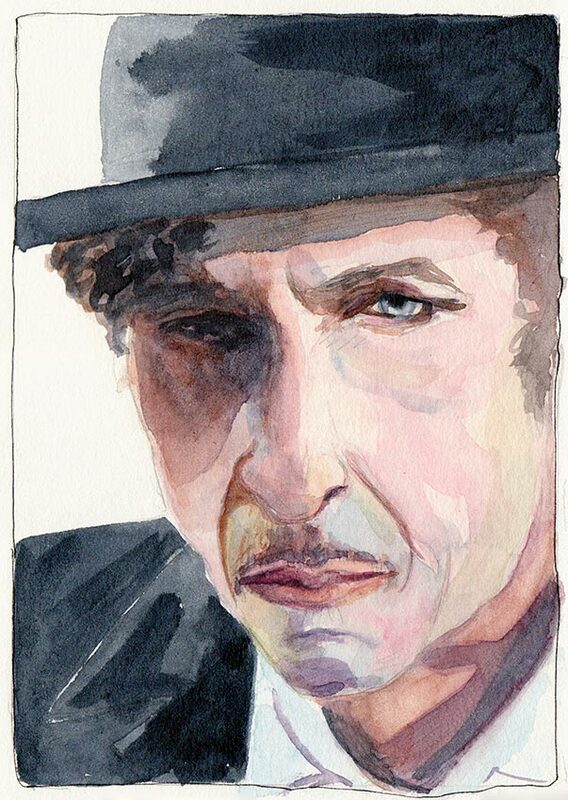 I am a huge fan and have painted him too….but a younger version…..
Why is it that I never met Dylan in my dreams?!!?!! I love Dylan, and am known for having psychedelic dreams… You are so lucky! And the portrait is great too!